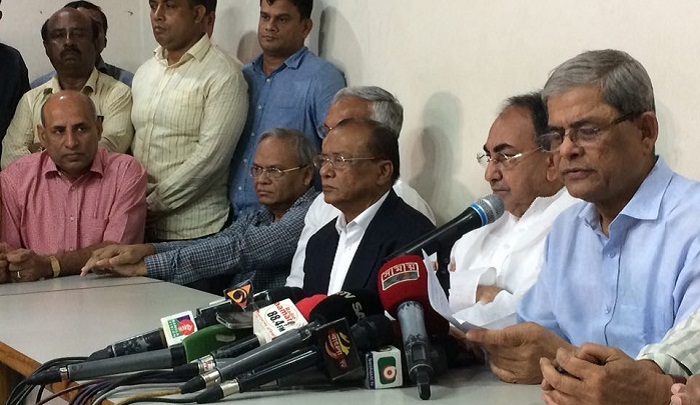 BNP Secretary General Mirza Fakhrul Islam Alamgir on Monday night alleged that Bangladesh has now turned into a true ‘repressive state’ as the government has no accountability to people. “Bangladesh has now become a genuine fascist state where people have no freedom, basic rights and any security,” he said. Fakhrul came up with the remarks while exchanging greetings with the family members of the BNP leaders and activists who were ‘repressed, killed and made disappeared’ at BNP Chairperson's Gulshan office on the occasion of Eid-ul-Azha. The BNP leader also alleged that many of their leaders and activists were ‘killed in crossfire, made disappeared, repressed in police custody and made crippled’ by openly firing shots on their knees. The BNP leader also came down hard on the government for what he said ‘suppressing’ the students who waged movements seeking quota reforms and safe roads. “The government has snatched people’s all basic rights. They’re now determining who have the right to survive and who have not. There’s no guaranty of people’s natural death, let alone their security. We’re cautiously enduring repression,” he said. Consoling the family members of BNP leaders who were made disappeared and depressed, Fakhrul said Allah will surely ensure justice for them. “We can’t take care of you as we always face a dangerous situation. We get a chance to meet you on the occasion of Eid. Our chairperson is also inquiring about you from jail,” he said. Fakhrul hoped that the country’s people will wake up and come forward to unseat the current ‘monstrous’ government. Later, Fakhrul presented the victim BNP leaders’ family members with Eid gifts.